Finding the equation of the line in y= mx + b form. 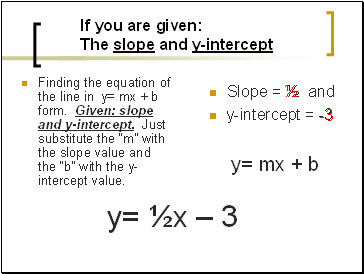 Given: slope and y-intercept. Just substitute the “m” with the slope value and the “b” with the y-intercept value. 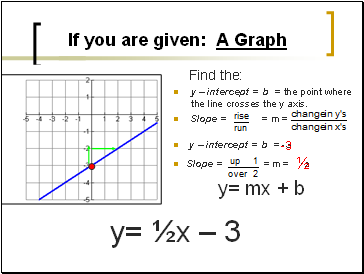 y – intercept = b = the point where the line crosses the y axis. 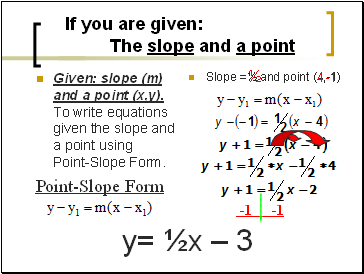 Given: slope (m) and a point (x,y). 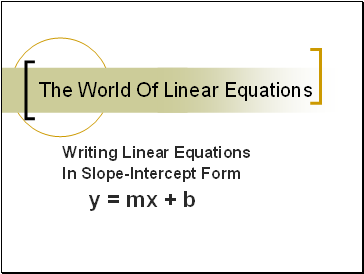 To write equations given the slope and a point using Point-Slope Form. 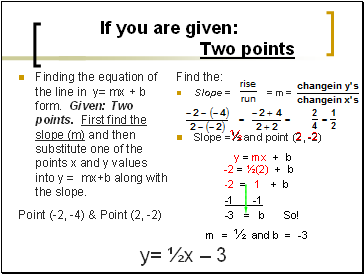 Given: slope (m) and a point (x,y). Substitute x, y, and m into y = mx+b and find the value of b (the y-intercept). Then write the equation substituting m and b values into y = mx + b. Finding the equation of the line in y= mx + b form. Given: Two points. 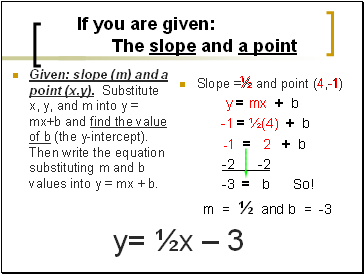 First find the slope (m) and then substitute one of the points x and y values into y = mx+b along with the slope. Finding the equation of the line in y= mx + b form. Given: Two points. 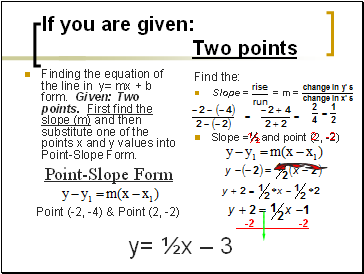 First find the slope (m) and then substitute one of the points x and y values into Point-Slope Form.